A while ago while my parents were still flea marketing they came across an interesting framed map in one of their buys. 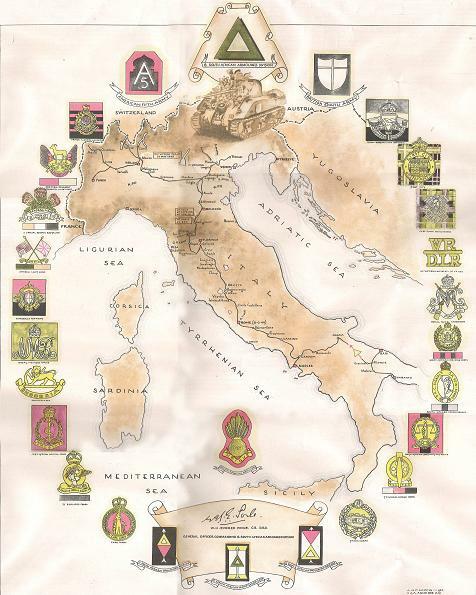 It was a framed map of Italy with insignia's of several brigades who had served in Italy during World War 2. Because I was researching my De Buys genealogy and the fact that we had known that my grandfather, Pieter Johannes De Buys (born 21/04/1915, died 05/07/2003), had served in Italy during World War 2 they gave me the picture. I stored the picture intending to investigate it again at some stage. Many months later I was going though some of the items I have stored pertaining to the family and I saw the framed map again. By that time I had received documentation from another family member giving Pieter's service records during World War 2. I got goosebumps when I looked at the insigna's and realized that my grandfather had served in the 6th South African Armoured Division which is a the head of the brigades indicated on the map! The South African 6th Armoured Division was the first armoured division in the South African Army and was formed during World War II. This division, the first true armoured division in South African military history, was formed in South Africa on 1 February 1943 from new recruits and units that had served in the 1st, 2nd, and 3rd SA Infantry (and Armoured) Divisions. It was based on a nucleus of men from the former South African 1st Infantry Division who had returned to South Africa after the Second Battle of El Alamein. The Division was initially transferred to Egypt for training, after which the division landed at Taranto, Italy on 20 April 1944. In Italy, the Division was deployed as part of the British Eighth Army and was then transferred to the United States Fifth Army for the remainder of the Italian Campaign. The Division operated as a strongly reinforced division and was frequently used to spearhead the advance of the Corps and Army to which it was attached. Despite leading the advance on Rome, the division was denied the honour of "taking" the city (entering the city first) by the United States Army. “However, the division was one of the first allied units to enter Florence two months later. The division's active role in the war ended when the German forces in Italy surrendered on May 2, 1945. Major General WHE (Evered) Poole was the sole divisional commander during its existence. They returned home after the end of the war in Italy and were disbanded in 1946.